Whispered rumors have reached both Kvatch and Chorrol regarding The Wolf's Crest and the Barony of Aspern. The Baron of Aspern has ordered Decentius guardsmen to investigate the disappearance of three employees from The Wolf's Crest. The trio was last sighted on the 10th of Sun's Dawn entering the Graf's Teeth woods. Newly hired chef, Xander Sallustius, the renowned Imperial lutenist, Ysabel Liore, and the son of the hostler, Aerin Cipius wanted to go swimming near the falls in the wooded area. The group failed to show for work shifts the following day. A search is being conducted. Lusilla Caepo, tavernkeeper for The Wolf's Crest, is said to have additional information. Check out Social Nights at The Wolf's Crest Tavern! Each Cyrodillian nightfall brings with it a new layer of snow, covering numerous tracks leading into an infamous Imperial estate. And each day, the impressions of boot and wheel are recreated and increase in quantity, along with the magnitude of wagons bursting with marble, stone and provisions. 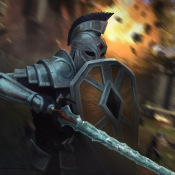 Blood shedding and the cries of war have ceased for a brief time, and where many soldiers dawning black and gold were once found patrolling roads along the hills of the gilded highlands, now travel traders, and new and old allies, pledged to a house of over a thousand years. But along side these merchants and wagons of restoration, come those who bare diverse colors in their plated and leathered encasings, armed for war as it never seems to end. Banners displayed from other noble houses of the same historic region, standards adorned with diamonds and wolves, alongside others of distinction within the Colovian heartlands. All moving towards one prominent estate, for what true reason, no one knows. A letter is seen tacked on a message board in the market of Kvatch. The penmanship is rushed, suggesting that this particular version is a copy. formally terminate their association with the Embers Alliance, and hereby forfeit their status as members, and abdicate their place on the council. 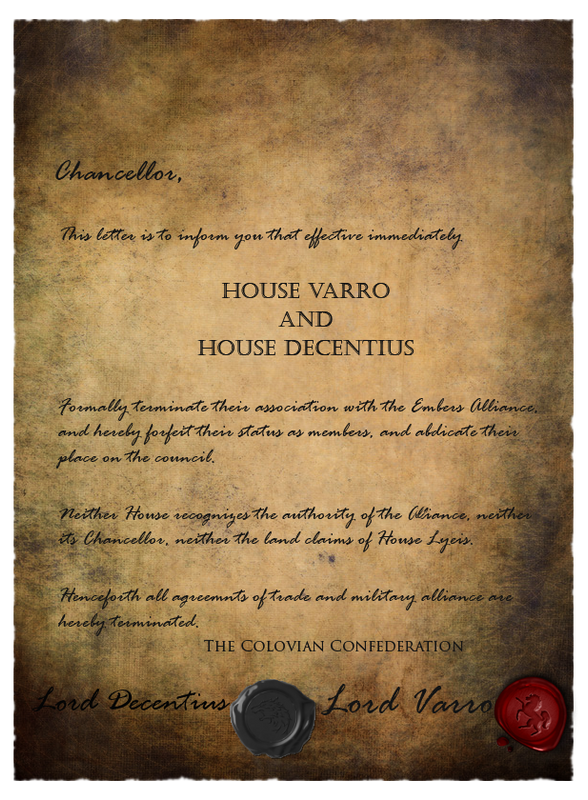 Neither House recognizes the authority of the Alliance, neither its Chancellor, neither the land claims of House Lyeis. Henceforth all agreements of trade and military alliance are hereby terminated. Whispers have reached the Gold Coast that the Westport city is preparing to vote on a formal declaration of war on House Mevento. 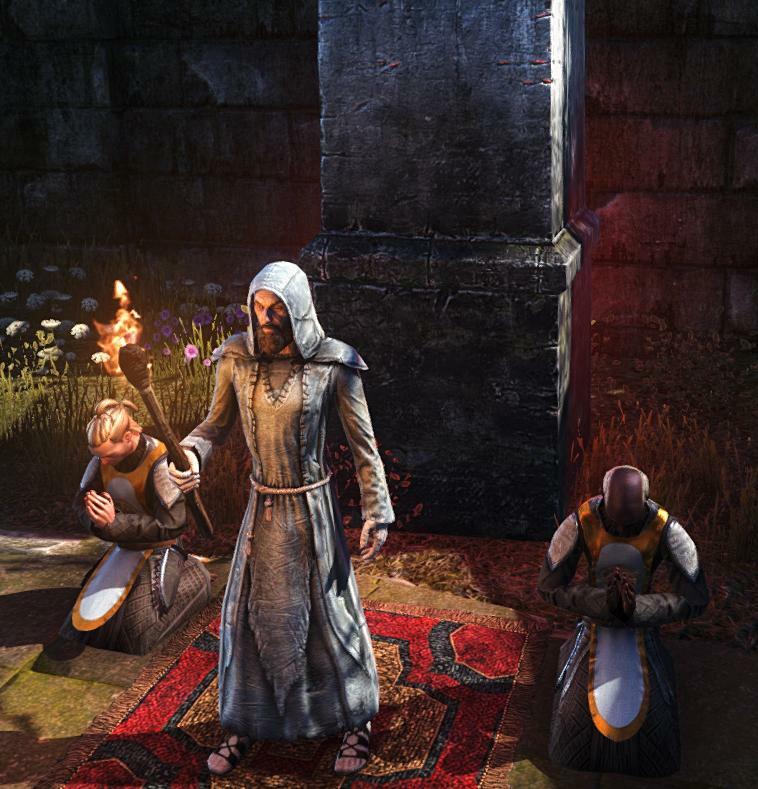 Kvatch is abuzz with chatter regarding The Festival of Laughs' charity auction. Townsfolk say Sabrina Caro is personally collecting donations for the cause. House Caro is rumored to be donating a yearling that is expected to fetch a substantial amount of coins. The Abbey of Saint Gallus, in the town of Pelgia, will receive all profits from the auction. An elderly woman claims she will attend to bid on a coffer rumored to contain the cure for loneliness. A Cyrodiilian road frequently traveled has become more unnerving in recent weeks. At least this is according to reputable brokers and devoted allies who have been turned away from one particular section of the thoroughfare, leading to a thousand-year-old Colovian house of war. Where once the Bucellarius of this great house patrolled outside of the gates, witnesses have seen men dawning more black than gold with scarcer ground units and a manifold of archers positioned high along the bulwark of the prestigious stronghold. And instead of the notorious Warlord coming and going with his expected retinue of officers and Bucellarii, a woman of blonde bearing the intense eyes of her father, dons regalia painted in the colors of Varro, and has been seen with her own entourage of sentinels and attendants. Whispers of the horse-lord’s death has begun to spread from within the walls of the fortress and those who have been in the service of the household for many years have wondered if this woman is here to settle the estate or claim what may now be rightfully hers. Rumors flow out from Colovian Highlands of heavy construction work. Marble seized from overconfident merchants from all factions, workers levied from quotas of soldiers-to-be. Taxes emboldened and the exchequer was enlarged to accommodate what many people say to be a quarter of a million crowns. Tavern talk says that the Baron raised taxes after the festival of laughs, opinions clashed on why it was raised though. Was it to pay for the hosting and accommodating of the new patrons? 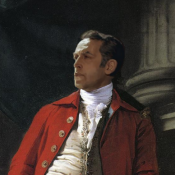 Some think so, others believe that the Baron is taxing everyone more to pay for the construction of another commodity for the people of his lands. However, a few people believe that although taxes were raised, the donations that were going to the Abbey of St. Gallus were taxed the hardest. The court treasurer was overheard to have mentioned that St.Gallus had grown quite fat and that not everything was needed for the hospitals. It appears with the recent bloodshed of the past, that no one is challenging or seeking to find out what's going on. What is, truly going on? Rumors abound in Anvil after the city guard was forced to break up a small gathering that seemed poised to turn violent. Three travelling clerics were accused of inflammatory speech directed at Saint Alessia and in praise of the Missing God. Two groups of citizenry had formed and seemed intent on doing harm to one another. The clerics were escorted out of town and were warned against returning. A local bosmeri beggar named Cingunor is said to have received substantial injuries from the beating he received from the citizens supporting the clerics. Following over a month-long standoff between Westport and House Mevento the spectacle seems to have come to an end. Both sides have come to an agreement regarding the broken treaty that lead to the conflict. Westport will receive reparations equal to the aid it was entitled to during past conflict.